Black leopards, also called black panthers, get their mono-coloration from a recessive gene mutation. The rosette-shaped spots that typify leopards are actually present on melanistic animals, those with abundant black pigmentation, but are hidden by the surplus of pigment. Melanism can be an evolutionarily favorable mutation for animals living in the low light of dense forests and hunting at night, which could explain why black leopards are common in Asiatic forests despite the recessive nature of the mutation. Black leopards occur predominantly in southwestern China, Bhutan, India and Myanmar, and throughout the Malay peninsula including the island of Java. In these areas, melanistic leopards are more common than those with the lighter-colored pelts of animals with dominant genes. In the Malay peninsula, nearly all leopards reported are melanistic. The melanistic mutation is less common in Africa, but individuals have been reported in Ethiopia, Kenya and the equatorial forests of Cameroon. Natural selection may play a role in the predominance of black leopards in Asia, where the melanistic coloration is more of an asset than in the African savanna. Leopards are found in nearly all types of habitat, including savannas, forests, scrublands and desert. Black leopards in particular are most common in the dense tropical forests of south and southeast Asia, where their coloration enhances their ability to blend with the thick vegetation in the low light of the forests. Leopards are most at home in low branches of the forest canopy, where they rest and stalk prey. They also drag prey up into trees to avoid other predators that would steal their kills. Black leopards are solitary, territorial carnivores. Their coats camouflage their presence as they stalk, then ambush, their unsuspecting prey. Leopards are nocturnal by nature, spending their days at rest. The melanistic mutation may be a particular asset for leopards seeking to hide under cover of night. Leopards are skillful swimmers and have excellent hearing, both of which are assets for hunting in dark tropical forests. All leopards are vulnerable to some degree; Asian subspecies, in which the melanistic mutation is the most common, are the most endangered of all leopards. Humans are the black leopard's primary threat. These animals are poached for their pelts and hunted for sport. 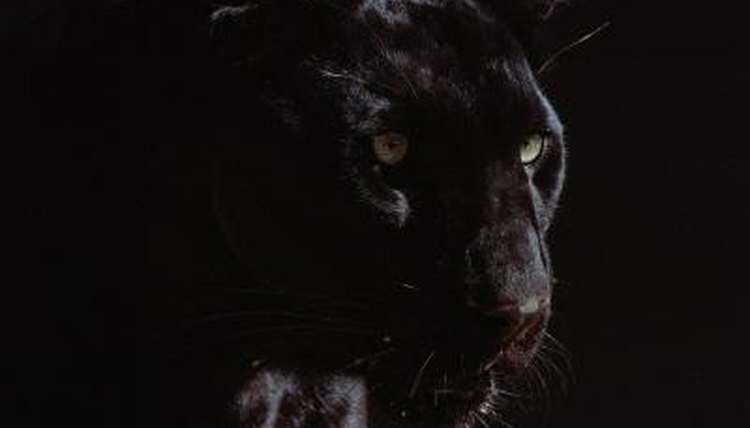 Black leopards also suffer from deforestation and the resulting habitat loss and fragmentation. As historic leopard habitat is cleared for agricultural use, leopards come into more frequent common with humans. Local farmers kill leopards to eliminate threat of attack on their livestock.